St Ecgwine, bishop of Worcester, founded Evesham in 700, in the Anglo-Saxon kingdom of Mercia. 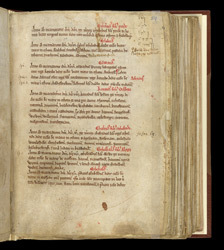 This cartulary, or book of charters, is one of two which survive from Evesham, along with a 'Book of the Acts of the Abbots', which Thomas of Marlborough put together in the 1220s. Charters can represent important documentary sources for study of medieval history and society, but sometimes they were 'tweaked' in the middle ages for purposes beyond documentation. For example, they could be used to create a house history, an assemblage which usually veers into a literary category. The Evesham Cartularies seem to belong with that group, as their contents show little consistency with each other. On this page, beginning with the year 701, the events of the founding of the abbey are told. Aethelred, son of Penda and king of Mercia, supports Ecgwine in his efforts to dedicate an abbey to the Virgin Mary. Following entries tell of further royal support from King Kenred of Mercia.